Dan Graziano of ESPN reported that free-agent LB Elvis Dumervil will work out for the 49ers to possibly add some depth to a thin defensive end group transitioning from a 3-4 to a 4-3, which Dumervil played during his time in Denver. Dumervil was injured for over half of the season in 2016 but after returning in Week 12, he was tied with Ryan Kerrigan for third in the league in total pressures from the left side (22). He is one of only four players to record at least 17 sacks in a season more than once since 2006, along with Jared Allen, DeMarcus Ware, and J.J. Watt. 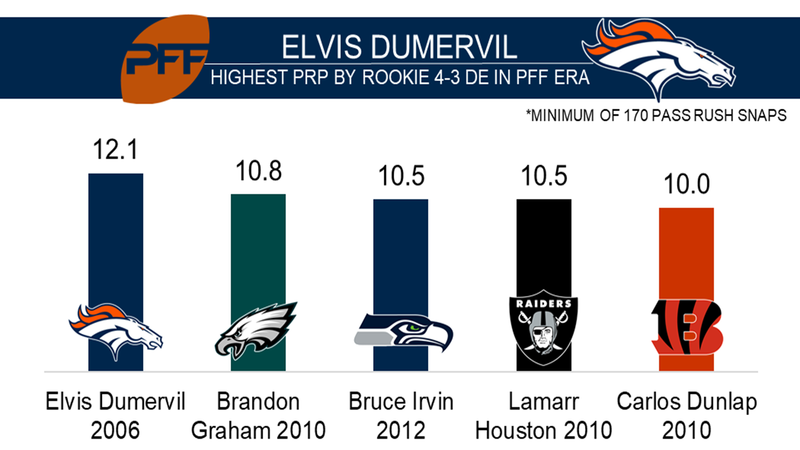 Only once since entering the league in 2006 has Dumervil not led his team’s position group in pass-rush productivity (which measures pressure created on a per-snap basis with weighting toward sacks), when he finished behind Pernell McPhee in 2014. His 113 career sacks are most of any player from the 2006 draft class, which includes players like first overall pick Mario Williams and first-rounder Tamba Hali.